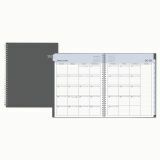 Blue Sky Passages Weekly/Monthly Wirebound Planner, 8.5 x 11, Charcoal, 2019 - Add sophisticated appeal to your desktop with the "Passages" sleek, professional weekly/monthly planner. Weekly calendar view per two-page spread contains space for daily schedule. Monthly calendar view per two-page spread offers ruled days for a visual overview of your time, plus a notes column. Thick, premium acid-free pages reduce ink bleed-through. 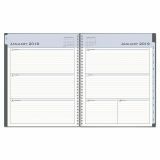 Features a clear interior double-sided storage pocket page. Durable solid flexible front and back covers. Twin-wire binding finishes the look and offers easy page turning. Includes six bonus monthly views (July - Dec).